Follow me as I travel around the world in my RV, exploring the beautiful sights that it has to offer. around the year 1000, Leif Eriksson, son of the adventurer Erik the Red, sailed west. He was probably not the first to make this trip, but he is recorded as finding a land where nice grapes hung thickly on vines. The name Vine Land stuck. Viking Norsemen arrived on a lonely outpost in the northern part of Newfoundland where they established a small settlement. Pat Sutherland with the Canadian Museum of Civilization, has done extensive research that seems to show the Vikings also left artefacts on Nunavut, Baffin Island, and Labrador. They may also have visited south to Nova Scotia and surrounding areas. Although the climate was warmer 1000 years ago, it may not have been warm enough farther north to have produced the vines of grapes that caused Leif Eriksson to name the land Vine Land. These likely were found to the south. get there. On Newfoundland’s west coast you head north past Gros Morne National Park almost to the very tip of a lonely peninsula. 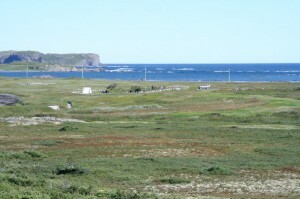 Route 430 follows the seacoast with spectacular views across to mainland Labrador. At Eddies Cove it strikes inland across the peninsula to Saint Anthony. Although you turn north before reaching this fishing village dating back to the 1500’s, you should take time to visit this town which is a favourite place for whale watching. Lonely garden along the road. 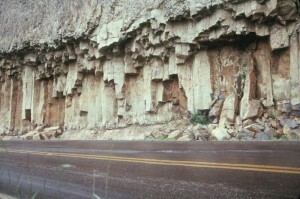 The highway winds through barren rock sparsely covered with vegetation in places. In other places there are steep hills and lots of short evergreen trees. 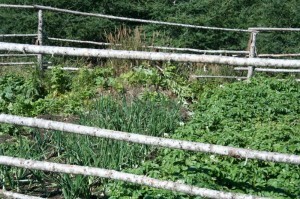 It’s interesting to see small gardens along the road, tended by people from town who have managed to find a pocket of soil large enough, and fertile enough to grow their vegetables. 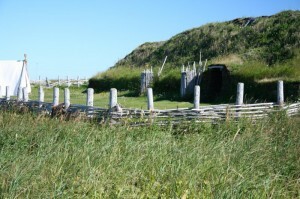 As you walk into the L’Anse aux Meadows NHS you are struck by the emptiness of the area. 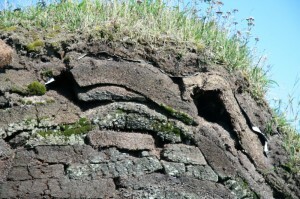 Yet in the midst of wind swept isolation you see several large humps that upon closer inspection reveal themselves as structures built with sod walls with roofs layered with sod and grass. 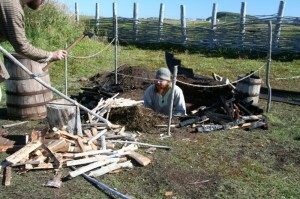 You enter to find a fire pit in the centre to remove the chill. Smoke escaped through the roof vents and probably caused a lot of stinging eyes and smoky lungs because smoke doesn’t always obey any rules, and might not all head for the upper vents. 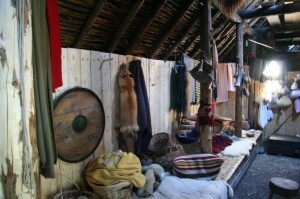 On the walls are hung furs, and nets, and finely woven garments. It’s obvious this settlement has been built for the long stay. Wooden bunks are built along the walls and covered with comfortable furs to sleep upon. Hung on pegs in the walls you will see an assortment of axes, hooks, and other devices made from iron. There is even an old loom for making cloth. Pit where iron is smelted. bog iron, close it over and let it burn to smelt the iron from the raw bog iron. This location is the first example of smelting in North America, and far ahead of the Europeans that Columbus brought to the shores of southern North America. 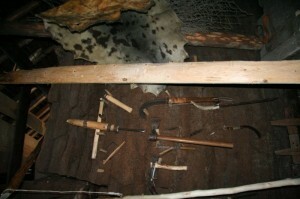 The production of iron meant they could make nails, and other simple tools. Travelling anywhere in Newfoundland will take you through miles of forests, lakes and mountain scenery. It’s extra special when you have the opportunity to visit a place like L’Anse aux Meadows. Before it was something for humans to worry about , the North American Continent was wracked by huge volcanic eruptions the like of which humans have never seen. Those who travel to Yellowstone National Park observe the eroded remnants of these calamitous explosions which form the Yellowstone Caldera. 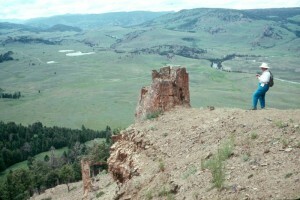 Yellowstone NP is the youngest of a string of calderas stretching from Oregon to Wyoming. One theory is that about 17 million years ago a meteor plunged through the earth’s crust into the underlying mantle which released the pressure below and a massive eruption followed. Yellowstone in Wyoming, when the hotspot was created in Oregon? Well,the answer is a bit confusing. The hotspot never moved. It’s still where it was created 17 million years ago. Instead Yellowstone NP is now sitting over the hotspot because the crust of Central North America is slipping southwest at about 2” each year, so 17 million years later, Wyoming is sitting where the old Oregon would have been. There are other theories, but I like this one. Now, on the crustal journey southwest as the crust moved across the hotspot the eruptions would cease for a time, and then pop up sort of like a cutting torch punching through steel, and then there would be another huge eruption and another caldera. There is a chain of the calderas running northeast across the country from Oregon to Wyoming. magma has the ability to absorb huge quantities of water which remain absorbed so long as the pressure is kept on the top. 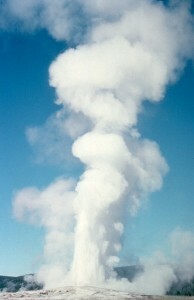 Release the pressure by cutting through the crust and the steam expands in a massive explosion carrying magma and anything else in the way to the surface. Great clouds of hot rock move across the landscape in great pyroclastic flows that weld together forming tremendous cliffs of soft rock. When you travel in Yellowstone NP some of the great cliffs are the result of these cooling pyroclastic flows. If you try to follow the trail of the calderas you will find it difficult to see much. Erosion has done its work and many of the old calderas are flattened. Highways pass right through the Rexburg Caldera but you’d not know it was there. 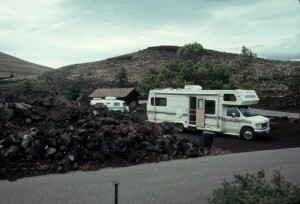 very interesting lava beds, and nearby there may be cinder cones from which the lava often flowed. 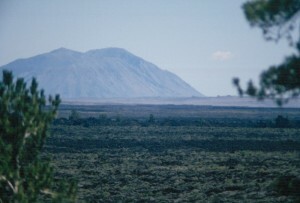 Craters of the Moon National Monument has preserved many of these lava flows and has good examples of cinder cones. 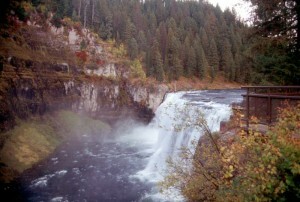 Whether at Yellowstone National Park, or areas farther west you will find interesting scenery, and great camping. Take some time and explore.